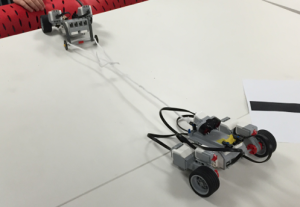 Four Students with ASD worked in groups of two building LEGO robots to play tug of war. 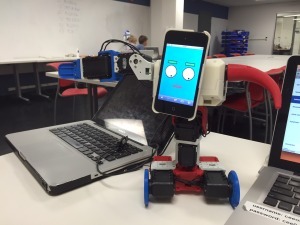 During the 80 minute workshop they designed and built a robot and were able to improve it through several iterations. While they were building NAO Robots Wilma and Fred, assisted as social mediators and data loggers. Hookie, the robot in the picture above and designed at Tufts CEEO and AISOY robot were introduced in the beginning of the workshop.